Welcome to the Candlewood Suites Loveland Colorado, the newest extended stay hotel in the Northern Colorado area. 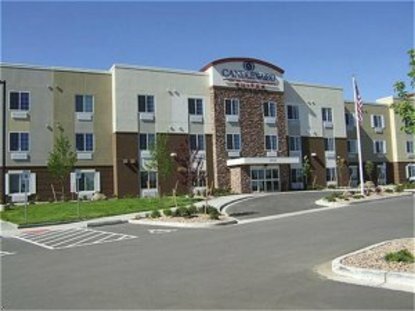 This hotel is conveniently located off I-25 at Crossroads Blvd. (exit 259), just minutes away from the Larimer County Fairgrounds, Budweiser Events Center, Medical Center of the Rockies and many other local businesses. Shopping, dining and entertainment are all located at the Promenade Shops at Centerra so this is the perfect location to be your &reghome away from home&reg while you are in Northern Colorado. Candlewood Suites Loveland Colorado offers all the amenities that you will need for your extended stay you will feel right at home in your spacious guest suite with a fully equipped kitchen and complimentary Internet access. The hotel features complimentary guest laundry facilities, the Candlewood Gym, complimentary business center, and the Candlewood Cupboard, where you can purchase meals, snacks and sundry items at value prices. If you&regve had a stressful day and need to unwind, you can gather with friends for a cook-out on the Candlewood Gazebo or pick up a free DVD from our lending library. Consider us home This hotel is committed to providing accessible facilities under the American Disabilities Act. If your accessibility needs are not met, please contact the Hotel Manager on Duty. Should you require additional information regarding accessible facilities for guests with disabilities, please call 1-800-Holiday (U.S. and Canada) or contact the hotel directly. For the hearing impaired, TDD service is available at 1-800-238-5544 within the U.S. and Canada.